Boy, do I need a happy hump day. 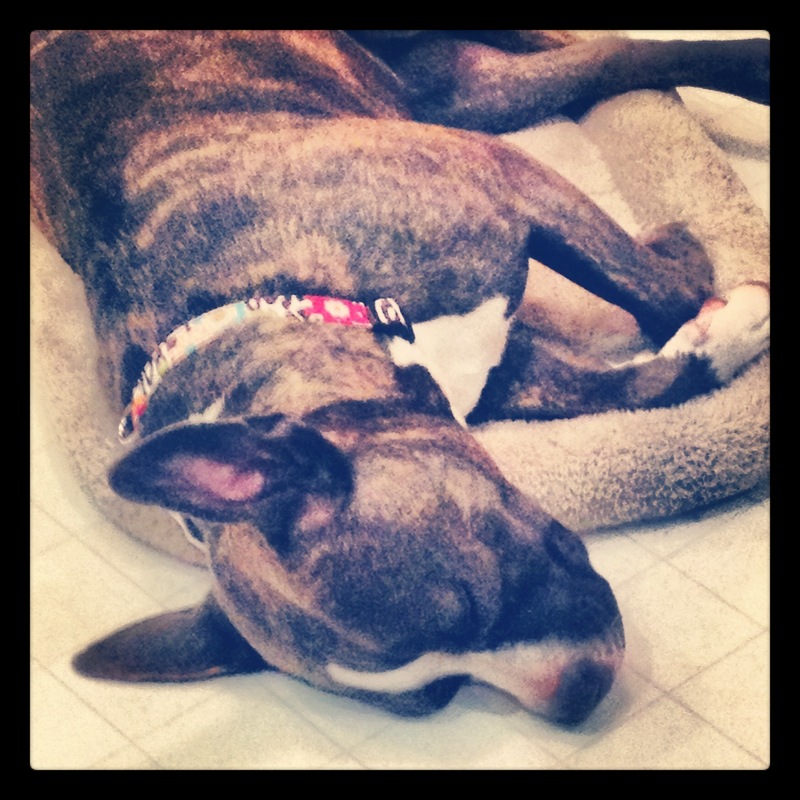 Things have been ca-razy around here, I’m beginning to think there is never any breathable downtime here! Part of me loves it, the other part hates it, mostly because life gets away from me and I have no idea where it goes! All of the sudden, a week passes and I still have tons of work to do! 🙂 I’m definitely not complaining though, I’m very blessed to have this job and work with such amazing people. Yesterday was a particularly bad day for me and one of my co-workers (whose birthday happens to be today!) got me a little Starbucks gift-card to cheer me up. I’m serious: my co-workers > your co-workers, I could not have asked for better ones! It doesn’t always go smoothly, after all, we are a family and each family has their rough patches. But they are all super supportive and really care personally about one another, that’s something not everyone gets when working, so I’m very glad I have mine! Anyways, last Friday we had another craft and wine night… of which there was no wine and very little crafting done… on my part. Do you ever get those days where you just feel all Austin Powers like and have lost your “mo-jo”? It was one of those days. 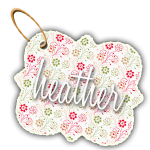 After another rough day, more personal than work, I just was not feeling the crafting vibes from the goddesses of all things glitter, mod podge and paint… I don’t know where they ran off to. Luckily my cousin and sister still had theirs and whipped out some amazing items! 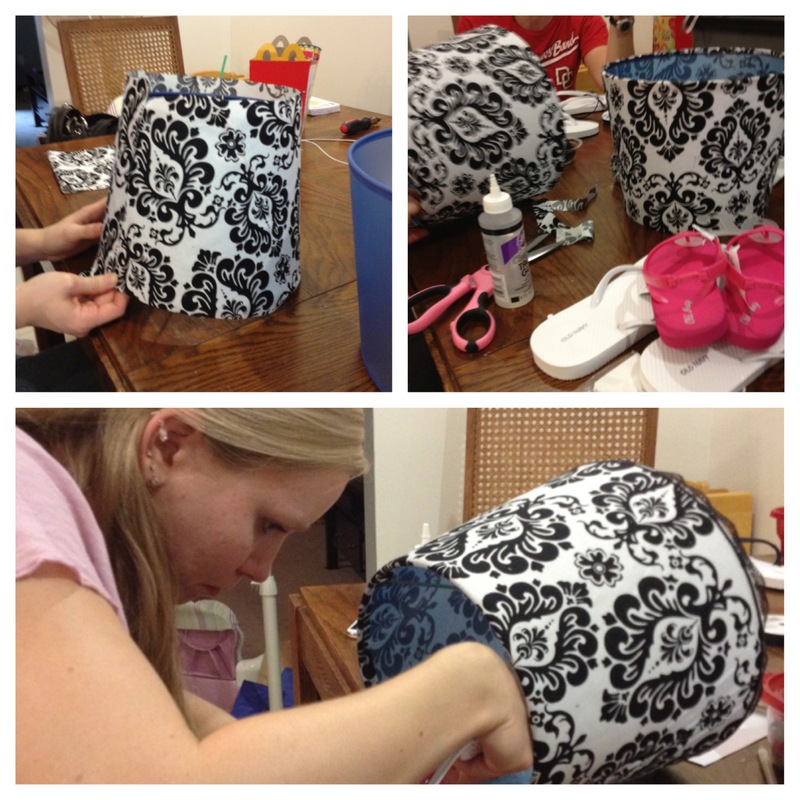 Courtney re-purposed two lamp-shades with some damask fabric, they looked awesome when she was done! 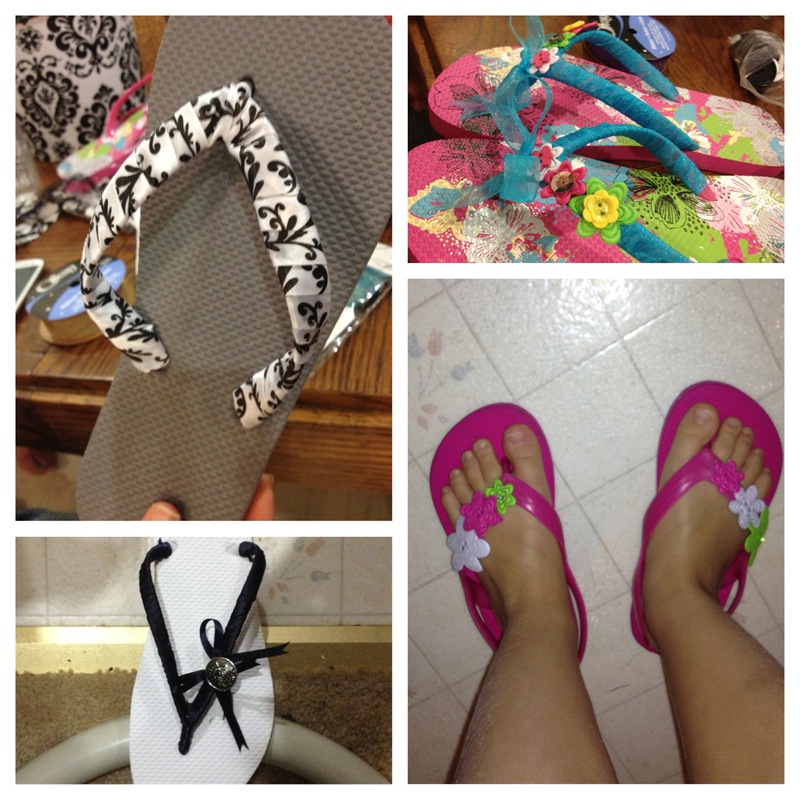 I at least got ribbon around my flip-flops… not much could be said for the rest of it… so instead I took pictures of vegan recipes from one of my sisters cookbooks ;). Courtney and Michelle got a lot done, even with the new bundle of joy! 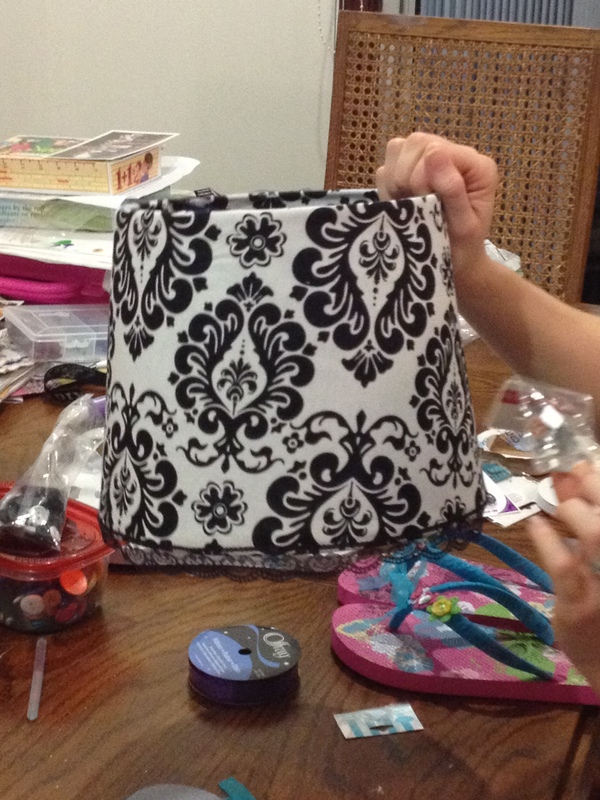 Courtney used some damask ribbon for the top left and then decorated the top right for a friend. Michelle went all Navy on us (our dad was both a Navy brat and in the Navy himself) and made some for Zoe to use next summer! Cute! Zoe loved them! 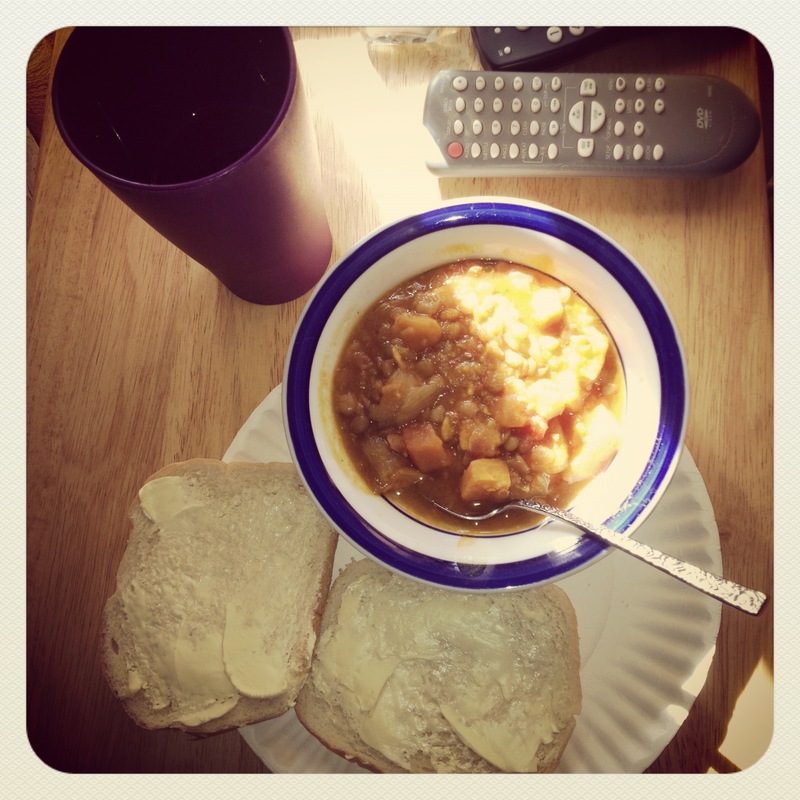 I was able to utilize some of those recipes and made some vegan “Sweet Potato Lentil Stew” from The Kind Diet book! I have to say, I’m a pretty awesome cook… minus the crying that occurred from the onions, that was no bueno. 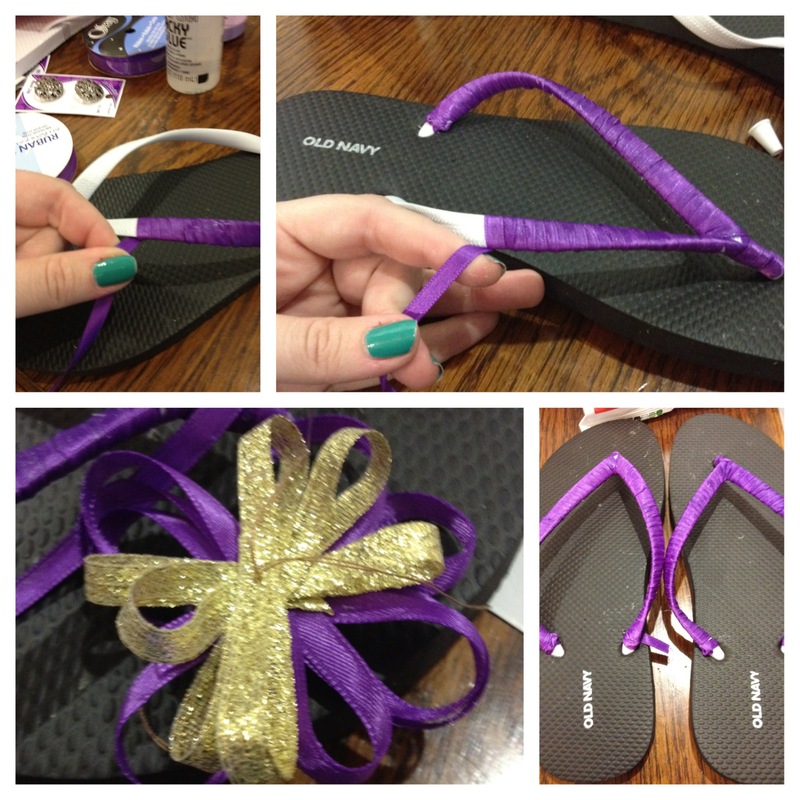 Next post: I finally finished a pair of flip-flops, but not the ones I originally started here… fail. 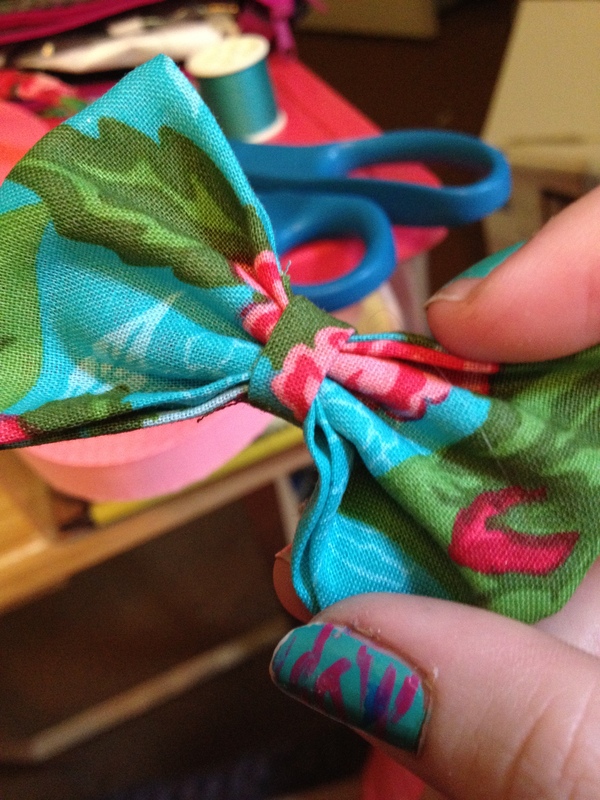 But here’s a peek! Thanks! It is amazing! I always think it has a bit of a bbq taste to it, but the mixture of spices in it is AWESOME. It’s great for the winter, I definitely recommend!